Last week, Gaurav Jain of Founder’s Collective wrote an excellent post that argues founders of consumer unicorns are rarely repeat acts. As is well known, the startup / venture world is largely defined by a power law, where the top few companies represent the vast majority of enterprise value created during their vintage. Many of the founders of these category defining consumer companies, especially social networks, are either first-time entrepreneurs or have not had major successes (from a venture perspective — so exit values of at least a couple hundred million dollars) prior to starting their latest venture. Certainly when you think of the iconic social companies of our generation (where Gaurav focused) — Facebook, Instagram, LinkedIn, Pinterest, Snapchat, Twitter, Whatsapp, and Youtube — only Twitter is a clear case of a successful serial entrepreneur at work. Based on the (rough) results of those searches, it seems just over half of the North American public consumer tech companies and private consumer unicorns had at least one person who previously founded a company on the founding team. 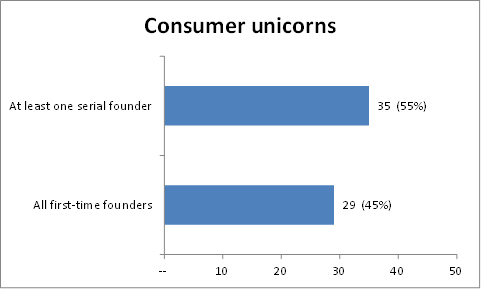 Without having the exhaustive dataset required to know for sure, it seems reasonable to guess that the average consumer startup with a serial founder is more likely to be a unicorn than one with all first-time founders. There are, of course, many reasons why having a serial founder on a team might be an advantage. One answer might be that the lessons and relationships an entrepreneur obtains during his or her first venture (whether it’s successful or not) are helpful in the next, which improves their odds of breakout success even in consumer startups. Another might be that, given angels and VCs prefer to work with serial entrepreneurs (due to the former line of reasoning), the set of founders who receive the support to help grow their businesses biases the pool of consumer unicorns towards those with serial founders. I’d imagine both have some grounding in the truth — but would welcome seeing the analysis from someone else! A related question that springs from that analysis is — what sectors are these serial founders concentrated in? 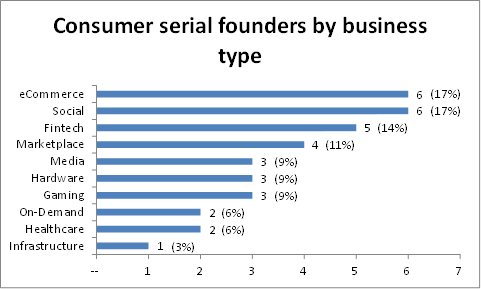 Somewhat surprisingly, these serial founders are distributed pretty broadly across consumer tech sectors— including many where a large network of engaged users ultimately drive enterprise value (marketplaces, social, media, on-demand). Ultimately, I think Gaurav is right that building multiple consumer unicorns is a rare feat, and his rationale makes a lot of sense. But I think the above makes the case that having some previous founding experience on your team probably doesn’t hurt, regardless of what sector you’re in. Happy to hear if you’ve got other interpretations — or if you’re interested in getting the spreadsheet I used and playing around with the data yourself. With any exercise like this, there are some judgement calls! You can find me at @ablordesays. Startups, political economy, productivity, rap, bbq, fiction, barbershops Now: @4DegreesAI. Before: @PritzkerVC, @mestghana, @bainalerts, @Harvard.